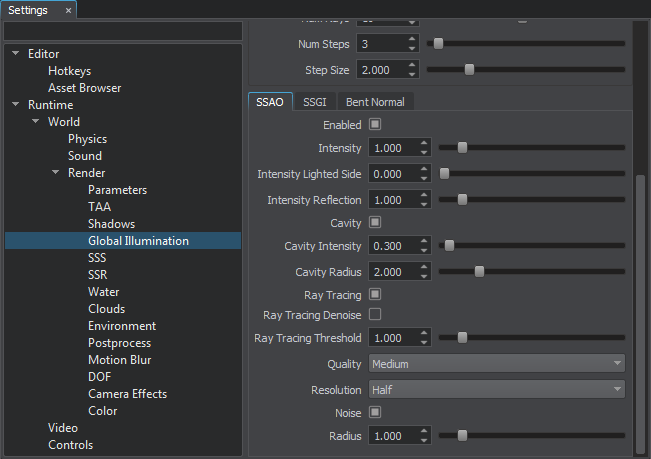 This section contains settings related to screen-space ambient occlusion (SSAO). Toggles SSAO on and off. By the minimum value of 0, the ambient occlusion shadowing is the lightest. By the maximum value of 1, the ambient occlusion shadowing is the darkest. It is recommended value. Brightness of shadows on the object's lighted side. This option should be used to create smooth transition on objects junctions. Intensity of SSAO on reflections. The option should be enabled if the SSR effect is used. Enables or disables the cavity option for the SSAO effect. This option improves (sharpens) the look of junction contours at low resolutions, so it should be used for detail enhancement (small stones, bolts and so on). Intensity of sharpening of contours for the cavity option. Size of junction contours area for the cavity option. Toggles screen-space ambient occlusion noise on and off. We recommend to use it with TAA enabled. By low values, each point can shadow only the points in the close range. By high values, each point shadows farther positioned points. Enables or disables ray tracing for SSAO calculation. When enabled, SSAO provides more realistic shadows between the objects. Ray-traced SSAO calculation available only when the SSRTGI technique is enabled (Rendering -> Features -> SSRTGI). Enables or disables noise reduction for the ray-traced SSAO. This option reduces noise by using the blur effect. Limits ray-traced SSAO in areas where SSRTGI cannot get information.